Tawney and James both grew up in families that taught the value of crafting. James began carving with his grandfather, a local artist who was known for his intricate miniatures, and now specializes in a wide variety of turned items. Tawney started stitching with her grandmother as a child and dedicates her time to embroidery and needlepoint. Stitch In Turn grew from a hobby to a small business nearly four years ago when we started experimenting with tools for stitching. Combining James’s passion for wood turning and Tawney’s interest in sewing tools and organization, Stitch In Turn creates high-quality, handmade, and customizable pieces for sewers of every level. 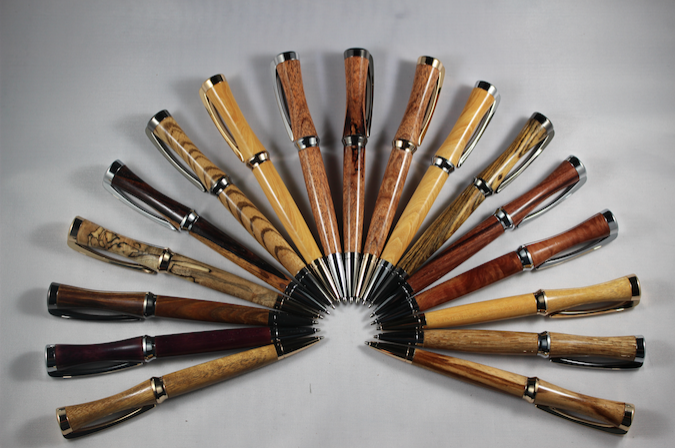 We sell a variety of turned items but specialize in tools for stitching, quilting, knitting, and crochet. This includes tool blocks, laying tools, seam rippers, yarn winders, pens, and holders for a teko-bari or Best Laying Tool. Each item is handmade and no two items are alike, therefore your order will not be an exact replica of the picture above. Some inventory available for immediate shipping. Custom work or currently unavailable items ship in 4-6 weeks. Beautiful Best Laying Tool Handle! THANKS! "Customer Service, Environment, Quality, Selection, and Wait times! Love your woodwork items. Its my first wooden laying tool!" Beautiful Best Laying Tool Case! THANKS!